(Seychelles News Agency) - A tribunal has been appointed by the Constitutional Appointment Authority of Seychelles to inquire into certain complaints that it believes raise the spectre of misbehaviour by the chief justice. In a press statement on Friday, the Authority said it had informed Chief Justice Mathilda Twomey of the setting up of the tribunal. According to Article 134 of the Seychelles Constitution, a justice of appeal or judge may be removed from office only for inability to perform the functions of the office, whether arising from infirmity of body or mind, or from any other cause and for misbehaviour. It added that the President of Seychelles, Danny Faure, has been informed of the Authority’s decision. 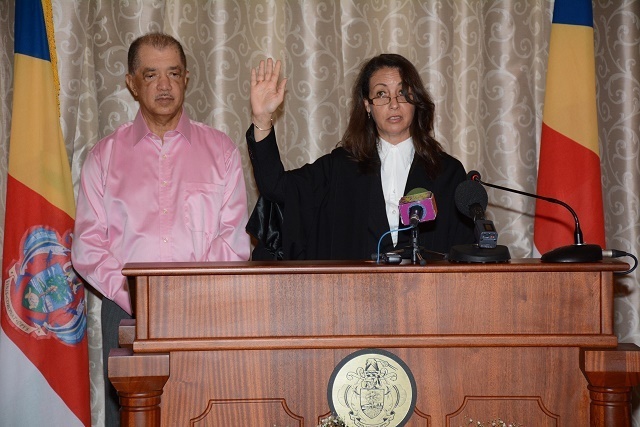 Twomey was appointed the new Chief Justice of the Seychelles Supreme Court, becoming the first Seychellois woman to be appointed to the post, in August 2015. The Commonwealth Lawyers Association, the Commonwealth Legal Education Association and the Commonwealth Magistrates’ and Judges’ Association have expressed their concerns about the decision taken by the Authority in a press statement. The three Commonwealth Associations stated that the existence of an independent and impartial judiciary is one of the cardinal features of any country governed by the rule of law. “By virtue of its membership of the Commonwealth, the Seychelles is committed to the shared fundamental values and principles of the Commonwealth, at the core of which is a shared belief in, and adherence to, democratic principles including an independent and impartial judiciary,” they said. Chief Justice Mathilda Twomey is the second top official of the judiciary to be investigated by a tribunal set up by the Constitutional Appointments Authority in the past two years. Supreme Court Judge Durai Karunakaran was suspended in October 2016 as a result of a decision made by the Constitutional Appointments Authority to refer Judge Karunakaran to a tribunal of inquiry to investigate into his professional conduct. Karunakaran was suspended under article 134 (4) of the Constitution from performing his functions until the conclusion of the inquiry.